PMI’s Online Training Center is the place to find courses that fit your schedule. All courses include instructor-narrated recordings, slide presentation and course manual. Access your digital materials from any computer in your password-protected PMI Portal for up to 6 months. Certification courses also include a physical binder shipped upon purchase, along with supplementary study materials, and live proctored exam. PMI awards continuing education units (CEUs) for completion of these courses. See the individual course descriptions for more information. If seeking CEUs for other organizations, seek pre-approval prior to enrollment. PMI regularly adds new courses, so check back periodically or send a request to our Content Team. Take a look at some of our highest rated and attended topics. Learn how quality measures, data, and metrics will drive the new healthcare payment models. Receive guidance on proper selection and reporting. Instructor will provide strategies for how to query providers as for correct information. Gain the skills needed to take charge of a practice administrator role. The CMOM certification program teaches advanced concepts in the administration and management of policies, risks, and financial responsibilities. This course explains how to gather accurate patient information, make scheduling decisions, address challenging patient behavior and secure the privacy of sensitive patient information. Recorded sessions are adapted from PMI’s live class curriculum and include a digital course manual. This course will help coders curb error rates and denials that impact the practice's bottom line. Failure to code to the highest degree of specificity negatively impacts reimbursement as well as utilization statistics. Don't lose revenue because of modifier misuse, non-use or just to bypass CCI edits! This course will explain modifiers and when it is appropriate to use a modifier to obtain proper payment. Review documentation guidelines and tough billing situations with examples and guidance on documentation needed to support mid-level provider claims. This class is an essential coding primer with detailed instruction and workbook exercises to quickly improve coding proficiency and accuracy. This course is suitable for medical office managers charged with establishing and enforcing OSHA and hazard communication standards in the medical office. Receive expert guidance and tools to lead a high-performing medical office team. This course is a virtual toolkit for any current or aspiring medical office manager. This course provides a comprehensive review of HIPAA policies, notices of privacy practice, restrictions of the use of PHI for marketing, sales and fundraising, and employee training on privacy obligations. Establish policies and processes that support the administration and communication of financial responsibilities. Improve insurance data collection, eligibility verification, and patient communication. This course will explain responsibilities and liabilities in a medical office. Review numerous case examples and receive guidance on compliant patient communication, reporting a breach and more. This course will provide guidance on how to perform level-of-service audits. You can pay a consultant to do it, wait for an audit letter, or take a proactive stance and implement ongoing self-audit procedures. Gain confidence that you are securing correct payments from commercial carriers. This program provides an overview of health insurance plans and payment models. Receive tips to avoid common claims processing errors. Learn basic anatomy and medical terminology as applied to diagnostic and procedural coding. Gain the skills to accurately interpret the validity of the documentation and subsequent billing. Transform routine patient relations into outstanding customer service. Updated to include instruction for handling difficult personalities and emphasis on patient satisfaction for quality measures. Learn how to identify erroneous billing procedures that result in denials and rejections. Create a tracking system designed to minimize problems, lost revenue and audit risk. Troubleshoot denials and work within claim guidelines. Learn an internal chart documentation training system and reduce liability resulting from incorrect claims. 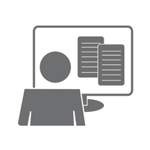 The instructor will go over the guidelines for proper documentation & service selection, including chart notes. If your office is caught up in a decreasing reimbursement cycle, it’s time for an A/R intervention! This program covers A/R as well as compliance and practice management efforts. This information-packed program covers the scope of operations in a medical front office. Improve patient communication, data collection, and privacy and security compliance to enhance office flow and the patient experience. Billing errors and denials cost providers millions of dollars each year in lost income and productivity. This class will cover all the statutory obligations, rights, roles and responsibilities of the Medicare provider. This class is designed to help coders work with providers to assess and gather the information needed in documentation to support appropriate code assignments. This program provides an introduction to ICD-10-CM, CPT® and HCPCS Level II coding systems and explores essential coding concepts that directly impact reimbursement for healthcare services provided in an outpatient setting. This program provides basic level instruction in diagnostic coding for the outpatient setting. Medical coders abstract details from the healthcare providers' reports to select or validate the proper ICD-10-CM code(s). This course provides basic instructions in procedural coding in the AMA CPT-4 manual for the medical practice or other outpatient setting. Learn to identify the components of an E/M service focusing on the three key components, define medical necessity and learn the general rules for documenting E/M services. Course provides an overview of AR management and collections in the medical practice. Learn how to educate patients on payment policies and succeed in securing timely payment for services provided. Health care attorney, Heidi Kocher, explains the legal aspects of medical office contracts, operational documents, agreements, and health care business governance issues. This course summarizes the 2019 code updates, guidelines & requirements for ICD-10-CM. Medical office coding/billing professionals, providers, office managers, consultants, and compliance officers will benefit from this content. Get the facts on the proposed changes to E/M that could go into effect January 1, 2019. Learn about the CMS plans for a major overhaul to E/M coding, reporting & its possible impact to various specialties. This course covers the new, revised, and deleted CPT® code changes, effective January 1, 2019. Learn how these changes impact your specialty to reduce denials and keep provider reimbursement on track all year long. This two-part, 3-hour course provides 2019 updates for medical office professionals. Get important physician reporting and reimbursement updates: 2019 Medicare Physician Fee Schedule, OIG Work Plan, QPP, MIPS, APMs, and much more. Expand your knowledge of evaluation and management (E/M) coding audits.Adopt a comprehensive self-audit system used by professional auditors. Includes auditing tools to help you audit like a pro. A proactive stance is your best defense against an audit. Sessions are adapted from live class lectures and include a physical course manual, support via discussion forum, and proctored exam. Learn the current guidelines & responsibilities to manage third-party provider reimbursement. Review documentation, diagnostic and procedural coding rules, and compliance. CMCOs are highly trained compliance professionals who understand the role, responsibilities, and tactical skills needed to control risk and lead practice compliance efforts. Learn how to analyze medical records to determine whether the documentation supports CPT and medical necessity, and minimize risks associated with outpatient E/M claims. The Certified Medical Coder (CMC)® is an advanced competency training program and certification for experienced medical coders working with outpatient medical claims. 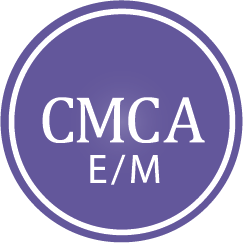 The CMC certification is awarded to individuals who have passed the comprehensive exam. Get more for less when you customize your learning track with these package options. 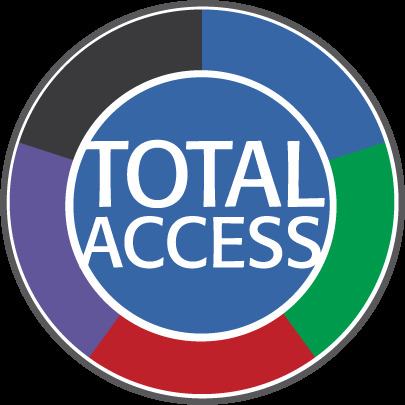 Get monthly access to a variety of live webinars covering practice management, billing, coding and compliance topics. For $249 a month membership includes access to a library of pre-recorded topics - more than 100 topics available. CMC, CMIS, CMOM, and CMCO certified professionals can earn 12 CEUs on a budget. Select 8 pre-recorded webinars, review content and pass the quiz at the end of each webinar to collect 1.5 CEUs each, 12 CEUs in total. This is a comprehensive CPT coding course with full instructions and review of terminology, guidelines, basic anatomy & body system functions in relation to CPT codebook chapters. Especially for new coders working in an outpatient setting, this four-part series covers the fundamentals of coding guidelines as well as an introduction to CPT, ICD-10-CM, and E/M coding.